Proper storage of chemicals in your school's science lab is essential for your students' health and safety. Without it, students may be overexposed to toxic chemicals, face mild to severe lab injuries or accidentally damage expensive lab equipment. Before you purchase any chemical storage equipment, take inventory of your supply and read up on our chemical storage do's and don'ts. Store chemicals in lockable cabinets, ideally secured to the wall or floor, and off-limits to students. Ensure that any shelving has at least a 3/4-inch front-edge lip to prevent spills. Ventilate storage areas for odorous or volatile chemicals appropriately. Store acids in a dedicated and clearly labeled acid cabinet. 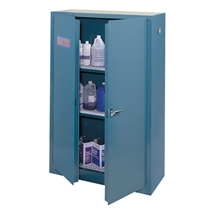 Store flammable liquids in a dedicated and approved flammable liquid storage cabinet. Store water-sensitive chemicals in a water-tight cabinet and apart from other chemicals in the lab. Don't store chemicals on the floor or on shelves above eye-level. Don't store chemicals with food and drink, and never use food containers for storage. Don't store chemicals in personal refrigerators. Don't expose chemicals to direct heat or extreme cold. If you're storing hazmat materials, double check your cabinet's certifications – it should meet the National Fire Protection Association and The Occupational Safety and Health Administration's standards for Class I, II, and III liquids (flammable and combustible liquids). Hazmat cabinets are designed to regulate temperatures and keep chemicals stable. Any certifications should be clearly stated in the product's specifications. When buying cabinets and shelving, it's easy to overlook weight capacity. Hazardous materials often come in durable, heavyweight containers and liquids like paint and ink can be quite heavy. Most cabinets have a 500-pound capacity per shelf.